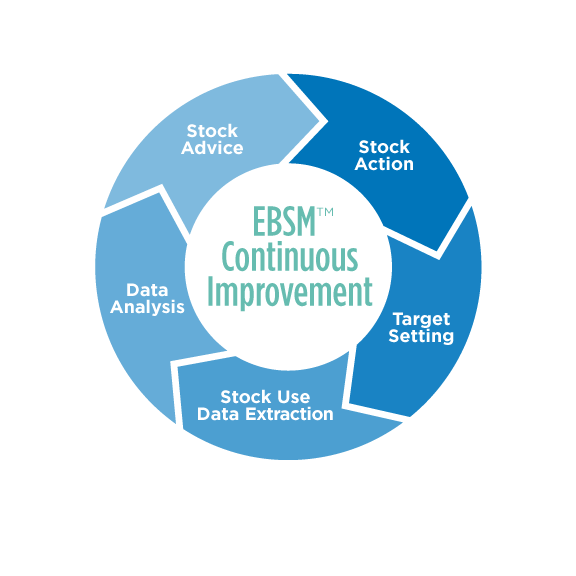 Evidence Based Stock Management (EBSM) is a complete library collection performance improvement methodology which compares historical and current information about collection use with local target settings to assist librarians in making collection management more effective, more patron focused, less wasteful, and more measured and performance based. The power of the methodology comes from the provision of an EBSM Toolset that helps to drive performance towards targets. 1. From the perspective of a librarian with extensive experience of collection development, a recognition that experience is not enough. Lack of access to robust detailed evidence about local demand leads to substantial waste in selection – from buying books that no-one wants to read, and neglecting to buy enough of the books which are popular with patrons. 2. The realization that collection movement is essential to maximize the use of existing items – on return visits to the Library, patrons want to see titles that they haven’t seen before. 3. Ongoing change in the culture of public libraries, where all services are being required to be more performance and market orientated. Taken together it is clear that there was a need to take a fundamentally different approach to collection management, and more importantly collection performance improvement. EBSM is a methodology for continuous collection performance improvement within libraries. EBSM comprises of Key Performance Indicators (KPIs), an EBSM Toolset, and a Framework that guides libraries through EBSM adoption using clearly defined Phases and Stages. At the heart of the framework is target-setting. EBSM uses target-setting as its fundamental basis because the very act of setting and meeting targets ensures that collection profiles change and provision begins to address patron demand. Targets are set and compared over time against unique data-sets – snapshots of collection usage at predetermined and regular points in time. By carrying out multiple data-set comparisons and cross checking results against targets, managers can begin to better understand how their collection is really performing. The tools above, while useful in their own right, really start to add optimum value when combined with collection use and selection advice and recommendations – the key intelligence that makes EBSM so powerful. Libraries worldwide are putting the methodology into action with the help of collectionHQ, a service based upon EBSM. Librarians who implement the EBSM methodology consistently save time and money while improving the performance of their stock and aligning it with their local demand. There are 4 phases in EBSM: Assessment, Acclimatisation, Consolidation and Excellence. Used consistently, EBSM can be a methodology for continuous collection performance improvement within libraries.